Elizabeth Wise is a semi-local singer and guitarist who’s definitely lived the wanderer’s life. Born and raised in Richmond, VA, she’s spent time in New York City, New Zealand, and Taiwan, all the while cultivating a deep love and reverence for the blues. She currently calls Memphis home, although she seems to be spending quite a bit of time in Central, VA, playing solo shows, showcasing her slide guitar playing, and her sweet n’ gutsy voice. Tonight, Wise is at Dish on Main Street, where the plates are small but the flavors are big. There’s no cover charge, and the music runs from at 8-11 p.m. Dish is located at 1120 Main St.; call (434) 528-0070, or find Dish on Facebook. In the world of Bartertown Bobby Fuller, houses are struck by comets, ships sink into the deep at night, and owls can be made out of pinball machines. Fuller’s a local sculptor whose medium is the stuff others cast aside. Like the late, great Howard Finster and other so-called “outsider artists,” he turns other people’s junk into the stuff of dreams. In Fuller’s hands, a stringy old mop head becomes a proud horse’s mane, and old electrical wiring is transformed into the rigging on a grand galleon. Several of Fuller’s works are currently on exhibit at the Academy Center for the Arts, and Fuller will be there to talk about his process as part of the Academy’s monthly series of art talks. “Trash to Class: From Garbage to the Gallery” begins at 5 p.m. and should run about an hour. As is traditional at gallery events, wine will be served. It is free and open to the public in the Ann White Academy Gallery, 600 Main St.; call (434) 846-8499 for more info, or click here. We love the Wikipedia definition of what’s known as a session, or seisiún in the original Celtic. Here goes: “A pub session refers to playing music and/or singing in the relaxed social setting of a local pub, in which the music-making is intermingled with the consumption of ale, stout, and beer and conversation.” It’s the intermingling we like so much, as well the idea of consuming conversation. The folks at Kegney Brothers, downtown Lynchburg’s one and only Irish pub, have been holding their version of a Celtic Session every Wednesday since the place opened. The music can be hit or miss, depending on who shows up to play. But the pints are always good, the bartenders take their pours seriously, and there’s good pub grub on the menu. The session-ing begins at 8 p.m. and continues until 11:30-ish. Kegneys is located right next to Dish, at 1118 Main Street; call (434) 616-6691 for more info. A few firsts for us here in our third week of publishing LynchburgDoes.com. We've got a different logo up top, designed by our web guy Jay. We may ask him to come up with a few more before long. We're also going to be doing our best to have at least one event for each day of the week, and we've started highlighting each day's events at the top of the page. We thought that would make sense. We'll be adding more features as we go. For now, welcome to the site. We hope you find it useful. We're hoping you'll sign up to follow us (our first newsletter should be coming soon), and please like and follow us on Facebook. To those of you who are returning, welcome back and keep checking back. Please tell two friends about LynchburgDoes.com. Make that three friends. If you're new to the site, glad to have you. There's a more detailed explanation of who we are and what we do right here. Our focus is still on being an easy-to-access hub for thoughtful, illuminating, and engaging events listings that are as detailed, accurate, and up-to-date as possible. So, we're doing our best to learn as much as we can about happenings in and around town. You can help out in that regard as well. If you're involved in planning events around Lynchburg, email us at events@lynchburgdoes.com. If you have comments, suggestions, or even just encouragement, feel free to email me directly at matt@lynchburgdoes.com. It’s not just any Friday, it’s Friday the 13th. And, while there are a series of films that address that issue head on, there are also some true Hollywood classics that are just plain appropriate for such a date. 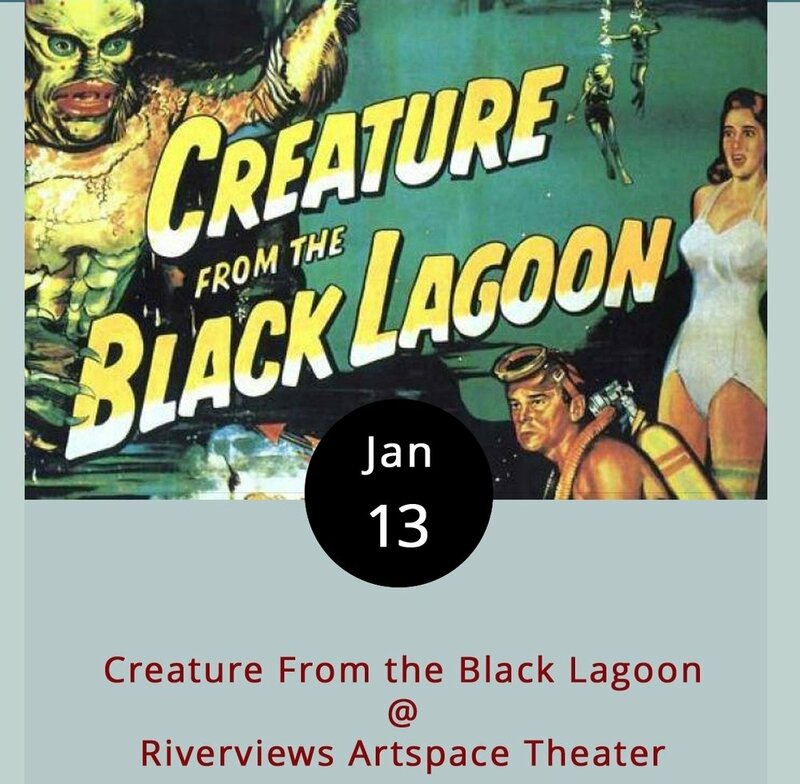 Jack Arnold’s cult sci-fi favorite Creature From the Black Lagoon is one of those classics. Will the lovely Kay escape the clutches of the grotto-dwelling Gill-Man? Good question. Find out when Riverviews hosts a special screening of the film tonight at 7:30. The screening is part of a film noir classics series that Riverviews started last year. The evening begins with a brief introductory talk by local artist and film buff Ken Faraoni. Riverviews is located at 901 Jefferson St. Tickets are $6; call (434) 847-7277 for more info or click here. Toffee-tastics. Savannah Smiles. Do-si-does. Tagalongs. And, of course, the ever crave-able Thin Mints, which we’ve been told are pretty good frozen, especially alongside a nice scoop of vanilla ice cream. In case you’re missing the hint, it’s Girl Scout Cookie season in Virginia. You could wait for the doorbell to ring, hope for a random run-in with a pack of Scouts, or take matters into your own hands and head on over to the Girl Scout Cookie Fest at Heritage United Methodist Church today from 11 a.m.-4p.m. We’re told there will be a cookie bake-off, face painting, a superhero dress-up station, and, yes, cookies, cookies, cookies, including a new one we found out about on the Girl Scouts’ “Meet the Cookies” webpage: S’mores. It’s $5 per person, but adults accompanying a child get in for free. The event takes place in the church’s Disciple Center Gymnasium, 582 Leesville Road. Hoppie Vaughan’s voice is surprising. Surprisingly awesome. Seriously. He and his band, the Ministers of Soul, specialize in Cajun blues, Southern blues, deep blues, and, well, you get the point. They’re bluesy. They’re playing tonight as part of the Ellington Presents series at the aptly named Glass House on Jefferson Street. They’ve been an Ellington staple for the better part of a decade now, according to Ellington board member Matt Cothran, and they tend to draw a crowd. The show begins at 8 p.m. Tickets are $10 in advance; $15 at the door. It’s a 21-plus show, with full bar service. The Glass House is at 1019 Jefferson St.; call (434) 616-3421 for tickets and more info, or visit the Ellington website. For a taste of Hoppie’s Ministers of Soul, check out http://www.hoppievaughan.com/music.html. How well do you read people? How do you form opinions about someone you’ve only just met, or someone you’ve never even spoken to? The Human Library project wants to answer these questions, and then it wants to make the answers kinder and more empathetic. The idea is to bring together people from different walks of life and put them on a sort of display. Visitors are able to walk around, people browse, and learn how to “read” individuals using something known as “conversation.” Sounds a little weird to us too, but in a cool way. The browsing begins at 2 p.m. at Riverviews Artspace, with the promise of a diverse array of humans, including a Buddhist, a survivor of domestic abuse, and an alcoholic. It’s free, open to the public, and just plain intriguing. Riverviews Artspace is located at 901 Jefferson St.; call 434-847-7277 for more info, or click here. When we checked in with Venue Cinemas to find out what’s trending in the multiplex, we got a poetic answer: Trolls, Dr. Strange, and Hacksaw Ridge. There’s a little something for everyone there: big-budget superheroics; big-budget war heroics; and big-budget toy heroics. It’s also just an amusing combination of titles. Hacksaw Ridge is Mel Gibson’s biopic about legendary Lynchburg WWII pacifist Desmond T. Doss. Dr. Strange is the new Marvel Universe film about a rather eccentric neurosurgeon played by one Benedict Timothy Carlton Cumberbatch (or just Benny C to his friends). And Trolls is a DreamWorks animated feature about trolls. Tickets on Mondays, and most days of the week, are cheap: $2.25 for matinees, and $2.75 after 6 p.m. Showtimes are 1, 4, 7:15, and 9:50 p.m. for Dr. Strange; 12:20, 3:30, 6:45, and 9:45 p.m. for Hacksaw Ridge; and noon, 2:15, 4:30, 7, and 9:15 p.m. for Trolls. Venue Cinemas is located at 901 Lakeside Dr.; call (434) 845-2398 for more info, or click here. If it’s Tuesday night (and it is), then it must karaoke time at Kegney Brothers. And, if it’s Kegney Brothers (and it is), then there’s excellent craft beer on tap, an impressive variety of Irish whiskeys shelved behind the bar, and hearty pub fare on the nighttime menu. A word about karaoke: living on this planet means making certain sacrifices, up to and including one’s dignity on certain occasions. Karaoke is one of those occasions. There’s room for shame when the big book of songs is open, and the sign-up sheet is out. It ain’t always pretty or on pitch, but it’s a good time. We’ve even heard from a certain bartender at Kegneys that it’s his favorite night of the week to work. The singing, which is often hosted by our pal Hope Irons, begins at 10 p.m. Kegney Brothers is located at 1118 Main St.; call (434) 616-6691 or go to the KegneyBrothers.com for more info. Hill City House Grille hosts a Martini Night on Wednesdays that kinda, sorta doubles as a “Girls’ Night Out.” To up the ante, they’ve got local country-music wunderkind Zach Burnette booked to play his version of swinging, bluesy, and sometimes even a bit boozy Americana classics just about every Wednesday for the foreseeable future. The martini specials are just five bucks, and Zach’s a mighty handsome dude, who looks the part of a young and hungry Nashville star. Speaking of hungry, the Hill City bar menu features wings and other tasty things. The action starts at 7 p.m. and runs until 10 p.m., and there’s no cover charge. The Hill City House Grille is located at 7001 Timberlake Road in Lynchburg; call (434) 237-6110 for more info, or click here.